by Sharon Noonan Kramer, advocate for integrity in health marketing and the courts. Lisa Schall has been on the bench for nearly thirty years and has a current annual salary of $181,292. This is the first time that anyone has challenged her government employment as a judge; and thus is the first time that she has not been automatically “re-elected” to public office by default. A long and lack-luster career, Schall has two (one & two) public admonishments from the Commission on Judicial Performance (CJP) for Canons of Judicial Ethics violations; a private CJP admonishment to protect the identity of the sexually abused child involved; a prosecution for drunk driving down the wrong way of a main thoroughfare; numerous reversals on appeal for her not understanding (or not caring about) the law; and countless complaints filed against her beginning in 1986 for which she has never been admonished. Die hard old habits die hard, fast forward to 2014. Judge Schall is named in an amended complaint, along with several of her jurist peers and San Diego County, State of California government officials, as co-defendants in a federal racketeering suit. The suit was brought by the California Coalition of Families and Children. Rather than admitting error or defending against the accusations of criminal acts on the merits of the case; the co-defendant jurists attempted to intimidate the families into dropping the suit by unsuccessfully attempting to have them sanctioned $10,000.00 for filing it. As you know, both Judge Rubin and Judge Rosenstein have expressed a concern coming from their colleagues on the Superior Court regarding your running against a sitting judge….Our good relationship with the bench is something we have worked hard to establish, and something we cherish and need to protect….Although all judges are individuals and subject to electoral challenge, they also collectively form part of the greater “Superior Court.” There is a great deal of collegiality among judges, and having a Board member of an organization that the judges strongly support directly challenge one of their own colleagues has raised concern…Because of the concerns coming from various sectors in the legal community, we ask that you consider resigning from the Board during the pendency of the election. This will protect THLA by not having a current Board member directly challenge a sitting judge..
influenced the verdict; that you refuse to even hear oral arguments for a new trial? his client’s perjury and his repeated suborning/benefiting from it in your court? Also in March, Judge Schall changed her endorsement page. Originally San Diego District Attorney Bonnie Dumanis, who is also running for re-election, was named as Schall’s No. 1 Endorser. Around mid-March, Dumanis’ name was mysteriously removed from Schall’s website. (What’s that all about? We think we might to know). As I understand it, ROSENSTEIN is scheduled to speak before the San Diego Democratic Party again on March 18, 2014. Her purpose is to dissuade the organization from endorsing a Democrat candidate for election to judicial office, Carla Keehn, who is running against appointed sitting judge, SCHALL. Please tell ROSENSTEIN to cease the unethical campaigning while abusing voters’ rights, candidate’s rights, and the prestigious title bestowed upon her by appointment –“judge”. Although no receipt of the Complaint was issued from Presiding Judge Danielson in violation of Rules of the Court, Rule 10.703(f)(3)**; the conspiring sitting judges stopped making appearances at semi-public meetings to coerce and intimidate Keehn’s endorsers to not endorse her. THLA excluded, organizations which were on the fence after being bullied and cajoled by the sitting judges, ultimately endorsed Keehn. The local jurists seem unable to contain themselves from violating Candidate Keehn’s and the voters’ rights to a free and informed election. Instead of spending time polishing up on their knowledge of Constitutional law, the local jurists put Judicial Candidate Rule # 2, “Thou Shalt Not Expose A Sitting Judge’s Crime“, into play. 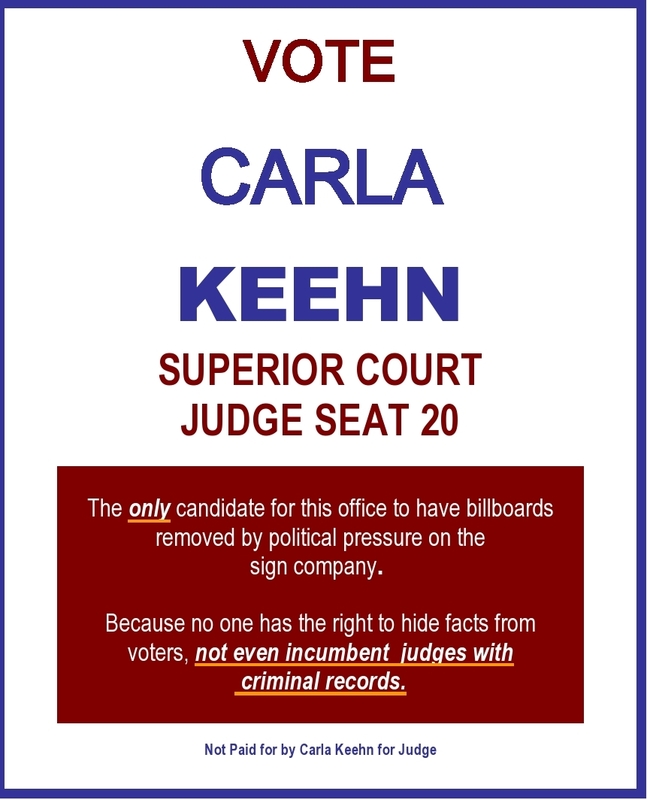 On May 8th, in an effort to inform the voting public that there are some serious and long-term ethics problems for Judge Schall (and obviously other local jurists); Carla Keehn placed four billboards around the city. The billboards accurately stated that Keehn is the only candidate for office 20 who does not have a criminal record — referring to Schall’s drunk driving debacle. Billboards can only hold so many words. Not on the billboard, but most relevant about Schall’s 2007 DUI, pled down Wet Reckless conviction, is that it is just one of countless ethics breaches and abuses of office; and the voting public has the right to know of them, including the one found to be criminal — so far. Apparently Schall and the powers that be, do not believe that the voting public has the right to know of Schall’s past indiscretions when voting on whether or not she should be allowed to reap more fraud upon the court. Just two days after Keehn’s billboards went up with the approval of content by the billboard advertiser, Clear Channel, they came back down. 1. What laws and Canon of Judicial Ethics permit the pressuring of advertisers to remove truth from voter view when a public election for a judicial seat is at stake? 2. It is highly unlikely that one little county judge, Lisa Schall, could by herself, pressure an advertiser of Clear Channel’s stature to remove the little judge’s challenger’s billboards. WHO pressured Clear Channel to remove Keehn’s truthful billboards and in what form did that pressure come? “Injustice anywhere is a threat to justice everywhere“. Is that suppose to be an inside joke? This entry was posted in Environmental Health Threats, Fourth District Division One Appellate Court, Health - Medical - Science, US Chamber of Commerce and tagged Bonnie Dumanis, California Coalition for Families and Children, Carla Keehn, judge david danielson, Judge Lisa Schall, Judge Paula Rosenstein, Sharon Kramer, Veritox. Bookmark the permalink.